RVF epizootics may develop after the climatic changes described in the previous chapter, usually associated with persistent heavy rainfall and flooding and subsequent occurrence of huge mosquito populations. The onset of disease is sudden and dramatic. The initial signs will depend upon the breed and genotype of the target animals. However, a sudden onset of abortions among sheep, goats, cattle or camels over a wide area is probably the most significant sign. There will also probably be sudden deaths and disease with many fatalities in all species, especially in the early post-natal period. Nearly 100 percent of young lambs of susceptible breeds may die. Older animals at one to four months may suffer an acute febrile disease with prostration and 10-40 percent fatalities. Adult animals in a milking herd show a febrile disease with agalactia. Some deaths occur, however, in all age groups. Young adult exotic sheep, for example, may die with acute hepatitis and jaundice. The simultaneous occurrence of an influenza-like disease among people working with livestock is an additional feature of RVF epizootics. It should be noted that resistant genotypes of indigenous African cattle and sheep often show no clinical signs of illness, despite having a brief period of viraemia. However, in some situations the cattle or sheep will have abortions that may be wrongly diagnosed. The abortion rate may reach 30 percent of the flock in small ruminant species, but is rarely more than this in indigenous breeds. The clinical signs of RVF in sheep and goats have been classified into four groups according to the severity of the disease. These are hyperacute, acute, subacute and inapparent. Each group is considered separately. In general, goats are less severely affected than sheep, with much lower morbidity and mortality, with fewer abortions and less severe clinical signs. Hyperacute RVF. Susceptible sheep breeds may suffer 90-100 percent abortion during periods of intense RVF virus transmission in epizootic situations. Some 80-100 percent of lambs under ten days of age, which are born during such periods, die from RVF. Most deaths are sudden and occur within 12 hours after the onset of a pyrexia (40-42°C). Collapse and death are all that may be seen. 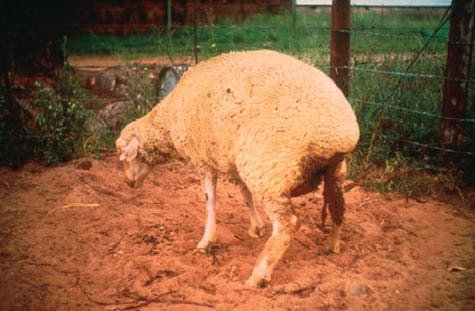 Other lambs may be depressed, too weak to suckle or stand, and die within 24-48 hours, without showing clinical disease other than fever, an elevated respiratory rate and prostration. Acute RVF. Older lambs, from two to three weeks of age and all susceptible breeds, may show severe clinical signs with high fever and an elevated respiratory rate, mucopurulent or sero-sanguineous nasal discharges, injected conjunctivae, vomiting and often abdominal pain. A generalized lymphadenitis and gait abnormalities may be detected. Animals are disinclined to move, become recumbent and often develop a haemorrhagic diarrhoea, and abortion. Deaths occur after 24-48 hours and may continue throughout the flock for up to ten days. Mortality rates may be from 10 to 60 percent. Sick and recovering animals generally show moderate to severe signs of jaundice. Subacute RVF. This is more frequent in adult animals. A febrile reaction develops of 40.5- 42°C and persists for one to five days. Anorexia, injected conjunctivae, nasal discharges, vomiting and other signs are seen but are generally less severe than in young animals. Abortion is a feature, as is diarrhoea. The colic may be less obvious, there may be some lack of coordination of movement, animals are weak or recumbent for several days but most recover. Many will be jaundiced and may remain unthrifty and weak for several months. The mortality rates are of the order of 5-20 percent. Inapparent RVF. This occurs in older or resistant animals. There may be transient periods of fever, which are not detected. The fever may be accompanied by depression or a brief period of inappetence, which are unremarkable. These infections are only detected by subsequent serological testing. Abortions may, however, follow such infections. Hyperacute RVF. Calves under ten days of age may suffer from this form of the disease and die within 20-24 hours with few, if any, premonitory signs. Signs that may be observed are sero-sanguineous nasal and lachrymal discharges, an elevated respiratory rate and a temperature of 41.5-42°C. Total prostration occurs with the animal lying on its side, with opisthotomus and progressively greater respiratory distress. The course of the disease is rapid and death occurs within 48 hours. Up to 70 percent mortality has been experienced in genetically susceptible breeds. Acute RVF. Older calves, yearlings and even adult animals show a high febrile reaction of 41.5-42°C, nasal and lachrymal discharges that may be blood-tinged, partial or total anorexia, some depression and possibly prostration. The animals may have colic with a profuse fetid haemorrhagic diarrhoea that persists for several days. A moist cough may develop with evidence of respiratory distress and rhales. The superficial lymph nodes generally become enlarged and there is a dysgalactia in milking animals. Animals may haemorrhage from the mouth or nose. Abortion commonly occurs. The temperature reaction and sickness may persist for three to ten days during which many animals die. Jaundice develops subsequently and, if this is severe, further mortality occurs. Animals of any age, from three months to mature adults, may show all or some of the above signs and experience mortality, most commonly in the younger age groups. Mortality varies from 10 to 40 percent, depending on the age groups exposed. From 5 to 10 percent mortality has been experienced among older cattle of susceptible genotypes. Subacute RVF. Older cattle generally show a less obvious response to RVF, which may be manifest as a brief period of temperature rise, with nasal and lachrymal discharges and a dysgalactia of three to seven days duration. There may be a brief period of profuse watery diarrhoea, often accompanied by colic. Some respiratory signs may be noticed, a raised rate and a moist cough with some rhales. Abortion is perhaps the most common consequence and this may occur during the acute phase of the disease or up to six to eight weeks later. Some deaths may occur. A persistent ill thrift may follow such mild infections, which is usually associated with moderate to severe jaundice and liver damage. Photosensitization is a common sequel to RVF virus infections. Inapparent RVF. RVF is usually inapparent in the majority of the adult susceptible and indigenous bovids in Africa, which are relatively resistant to RVF. Abortion may follow this infection in the susceptible genotypes but is rare in the indigenous animals in the classical RVF enzootic zones of the continent. This is the most common presentation of RVF in epizootics, where only a retrospectively noted fall in milk production, abortions and serological testing reveal the true extent of the infections. Camels do not normally show any clinical signs following RVF infections and fall into the inapparent infection group. They have a brief period of viraemia. Abortion is a common consequence of the infection, however, and pastoralists complain of all their camels aborting. The infections can be confirmed serologically. Deaths do occur in the early post-natal period in camel foals born during RVF epizootic periods, probably as a result of RVF. Wild ruminants do not manifest any clinical signs of RVF during epizootics of the disease, which may be affecting domestic animals in shared grasslands. However, they develop antibodies to the virus and may even abort, following inapparent infections, yet this is difficult to demonstrate in the field. The African buffalo, Syncerus caffer, has a viraemia for two days following experimental inoculation, and buffaloes may abort if pregnant. A viraemia persists over the period of the biphasic temperature reaction and possibly also after this has declined. There is a profound leucopenia associated with RVF infection, which is most obvious in the early period of the infection. 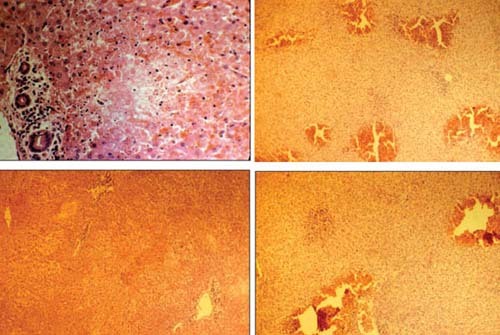 Severe liver damage results in high serum levels of the enzymes associated with this pathology, e.g. glutamic dehydrogenase (GLDH). The most important pathological changes are to be found in the liver. 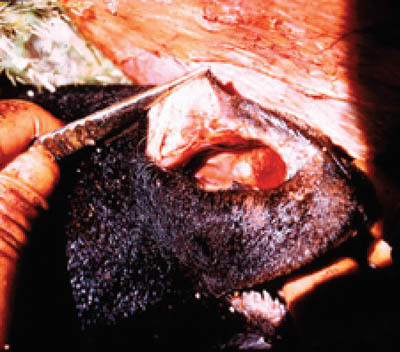 The severity of the lesions that develop will depend upon the age group and susceptibility of the animals affected. They are likely to be more severe in young lambs and less severe in older animals. 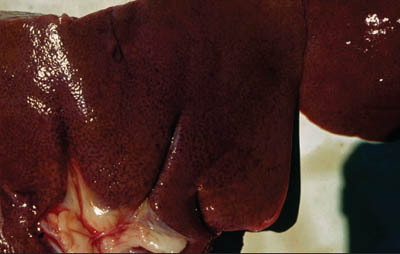 Hepatic necrosis is present in all RVF carcasses, for the lesions develop early in the course of the disease. In the early stages the liver is congested, swollen and engorged with rounded edges and many scattered petechial haemorrhages. 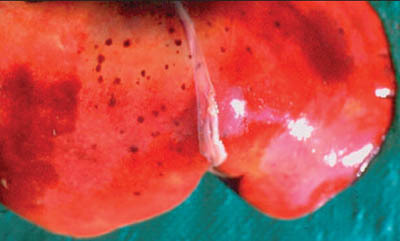 Later, the necrosis may be evident as small 1-3 mm foci, which coalesce to form larger areas of necrosis and these changes involve the whole of the liver. There may be widespread petechial and ecchymotic haemorrhages throughout the parenchyma and visible in subcapsular tissues. 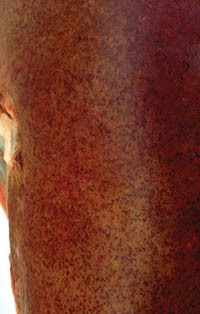 The necrotic changes induce jaundice and a stage is reached when the liver has a bronze appearance as the congestion, necrotic areas and icterus develop. At later stages the liver will be completely yellow with jaundice. 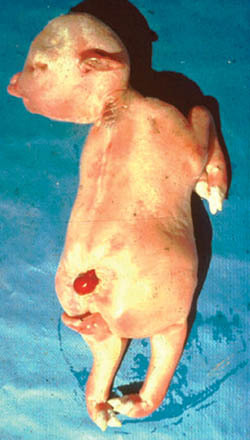 Petechial and ecchymotic haemorrhages may be found throughout the carcass in lambs. They are especially noticeable on the serosal and pleural surfaces of the body cavities, and on the heart, gall bladder, kidneys, bladder and other organs. There may be some bloodstained ascitic fluid. The alimentary tract usually shows some level of inflammation from catarrhal to haemorrhagic and necrotic. The serosal surfaces may have haemorrhages and also the mucosal lining of the bowel, particularly of the abomasum and small intestine and ileo-caecal areas. The lungs may be congested with oedema and emphysema and subpleural haemorrhages are commonly found. The heart will show subepicardial and endocardial haemorrhages. There is a generalized lymphadenopathy involving the superficial and visceral lymph nodes. These are oedematous with petechial haemorrhages. 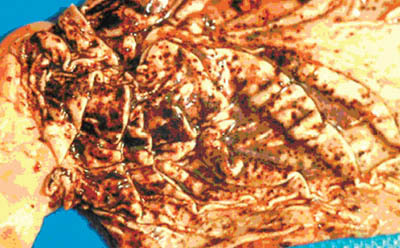 The spleen may or may not be enlarged with subcapsular haemorrhages. 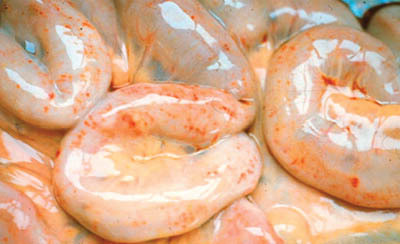 Similar changes will be found in the foetuses, particularly of the liver where various levels of necrosis will be seen. There is also a necrotic placentitis.